Last night started like any other. 10:00pm: watch the evening news. 10:30pm: brush teeth, wash face, talk with Drew while laying in bed. and that was as normal as it was going to get. at 11:30 Brayden woke up SCREAMING. I shoved Drew, and he woke up and groggily went to console Brayden and help him back to sleep. 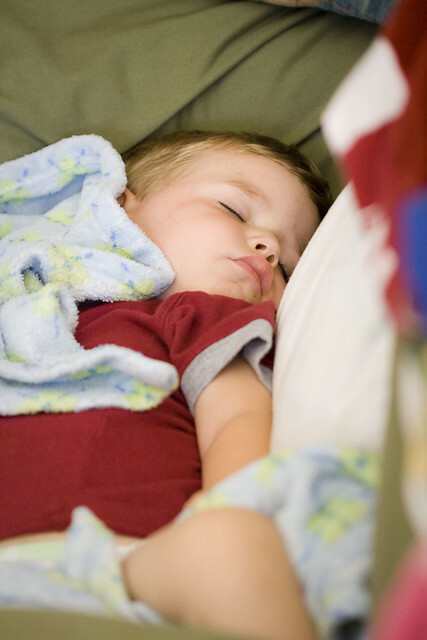 He came shuffling back to bed at 11:45.
midnight came, and Brayden woke up SCREAMING again. My turn. I shuffled in there. Nothing would console him. Looking back now, I should have known something was wrong. But I was tired. And delirious. So I brought him back to bed with me. Which Drew noted was not a good decision. And I sniped back that I was tired, B wouldn't sleep... what did he want me to do? Yeah, I'm nice like that in the middle of the night. After about 30 minutes of Brayden tossing and turning, making comments about the 'funder' (it was raining), and asking over and over and OVER again "do ya heeer dat?" whenever the rain hit the windows, I brought him back to bed. The minute I laid him down on his bed though, things went awry. He puked. And kept puking. And kept puking. I yelled for Drew. And sat there trying to control my gag reflex as I stared at my vomit drenched toddler, who was now crying. Ughh. I hate throw up. Drew took B, bathed him while I cleaned the room. After the drama and cleanup we got him back to sleep at 1pm. And it all started over again at 1:30. Thankfully the second time B didn't need a bath, but new sheets were still in order. My head hit the pillow again at 2pm, and at 2:30 a little toddler came to my bed asking for a cup. I figured he wanted water, but the minute my feet hit the floor, he started puking again. This time we made it to the potty for most of it. I should have just stayed up to clean house, because for the rest of the night, Brayden wouldn't sleep. Can't say I don't blame him. He eventually made it to our bed permanently at 4:45 this morning, but even then didn't shut his eyes. I am exhausted. Thankfully he is holding down food well and is acting completely normal. I'm hoping none of the rest of us around here get it. I finally convinced B to lay down on the couch with me today, and after some tossing, he fell asleep. Sweet baby boy. I heart him. If you think about it, please pray that the rest of us stay healthy, and this is just a quick virus for B. There's nothing worse than a stomach virus, especially when it's sunny and you want to play outside in the pool.